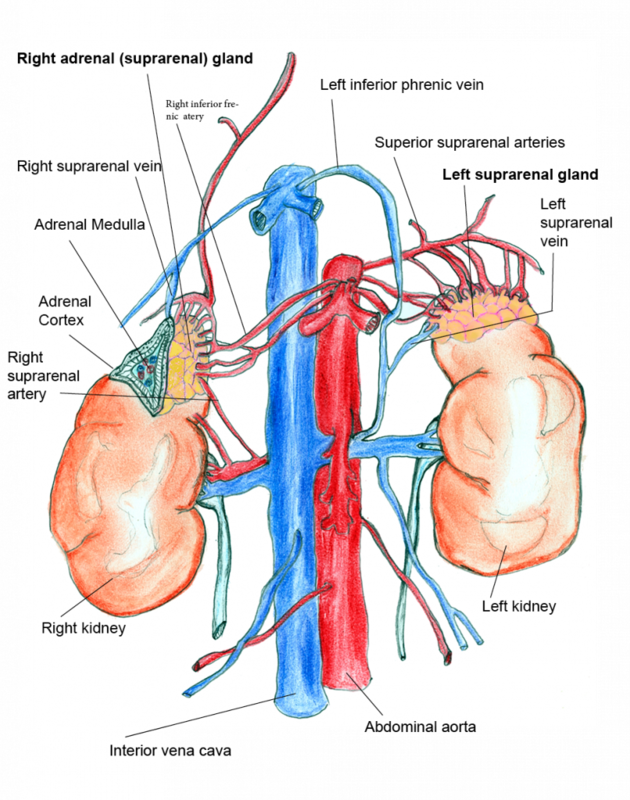 The adrenal glands, lat. Glandula Suprarenalis, are endocrine glands which are located above our kidneys, separated by a thin fat layer. This is the reason for the Latin name “supra”, meaning “over” and “renal”, meaning “kidney”. The term “endocrine” describes specific gland cells, which secrete their products, hormones, into the blood circulation. To understand this process it is necessary to take a closer look at the anatomical structure of the adrenal glands. The adrenal gland can be divided into two parts, an outer part called adrenal cortex, which itself can be subdivided into 3 layers (Zona Fasciculata, Zona Reticularis and Zona Glomerulosa) and an inner part called adrenal medulla. All in all there are two different gland systems producing different kinds of hormones. 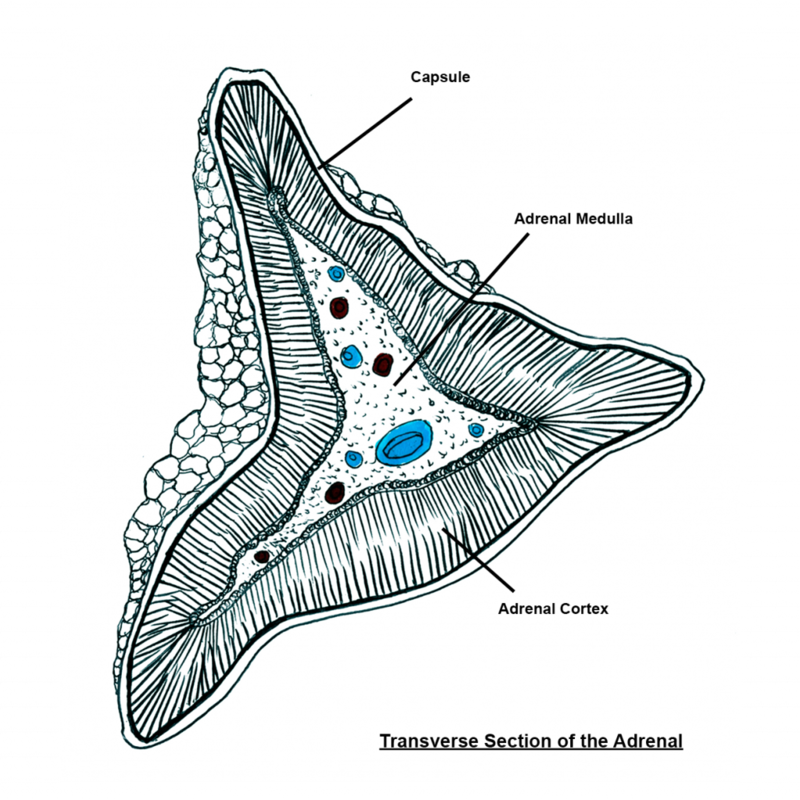 The adrenal cortex mainly produces steroid hormones, which are produced in the 3 layers. The outer layer, Zona Glomerulosa, produces mineral corticoids, especially aldosterone. This hormone is obligatory to resorb water back from our kidney, so that it is not lost with the urine. The more water being resorbed, the more increases the blood volume. Therefore aldosterone has a big influence on regulating the blood pressure and electrolyte balance. The Zona Fasciculata, situated between Zona Reticularis and Glomerulosa, mainly produces glucocorticoids such as cortisol and cortisone. Cortisol is an essential hormone as it influences the metabolism by increasing the glucose concentration in our blood circulation. It also takes part in bone formation and fat- and protein metabolism. Especially for medical treatments it is well known in its role as a suppressor of the immune system and therefore for its anti-inflammatory effect. In the inner layer called Zona Reticularis androgens such as dehydroepiandrosterone, DHEA, and androstenedione are produced. These are then converted to testosterone in the liver. Within the adrenal medulla, the second adrenal gland system, there are modified nerve cells, called A- and N-cells. As soon as there is a higher stress level in our body leading to an increased level of activity, those 2 cell types get activated. Activated A-cells start producing adrenalin, whereas the N- cells produce noradrenalin. Both secreted hormones will quickly increase heart activity in terms of increasing the blood pressure or heart rate. Cushing’s disease is characterised by an excessive production of cortisol. The disease is either caused by a tumour or the pathological growth of both adrenal gland systems. No matter what kind of origin, the clinical picture is always termed “Cushing’s disease”. Affected patients could suffer from a disturbed sugar metabolism. Besides treating the disturbed sugar metabolism it is important to surgically remove the tumour . In case of Conn syndrome or hyperaldosteronism the adrenal cells produce too much aldosterone leading to an increased blood pressure and a disputed amount of minerals in our body. Causes of the syndrome are divers. They can be linked to a tumour or to hyperplasia, meaning a pathological increase in cell number. It is common to treat patients suffering from hyperplasia, also known as idiopathic aldosteronism, with an aldosterone antagonist working against the hormone. In case of a tumour, surgery is recommended. Patients can not only suffer from hyperfunction but also from hypofunction of the adrenal, which is called adrenocortical insufficiency. In case of primary adrenocortical insufficiency, called Addison’s Disease, the reason for the disorder may be due to an impairment of the adrenal gland itself. These patients might suffer from autoimmune diseases. The secondary form of hypofunction develops from an impairment outside the adrenal gland, mostly located in the Hypothalamus (the inter brain). The Hypothalamus is not able to release adrenal gland stimulating hormones (e. g. ACTH) anymore due to a tumour or circulatory disorders. With those missing stimulating hormones the adrenal gland cannot produce enough hormones, especially cortisol. In terms of therapy it is important to substitute the missing hormone. A pheochromocytoma is a tumour located in the adrenal medulla, which consists of modified nerve cells that have a major influence on the blood pressure or the heart rate. Patients with that kind of tumour have a disrupted blood pressure regulation and it requires surgery to remove the tumour. Here you learn more about participation in Clinical Studies.